Dec.2 Pima Community College took their talents on the road for the first time this season. The Aztecs took a trip to Yuma, Az to take on the number 17 ranked Western Arizona college Matadors. Pima fell on the road by 5 points 96-91. The Aztecs looked good at the beginning taking a double digit lead into the half as there were up by 13. However the Matadors would not be denied a victory, on their home court as they came storming out in the second half outscoring Pima by 18. Pima seemingly shot their way out of the game as they shot 16% from 3 point range going 4-24. Pima’s Abram Carrasco lead the game in scoring putting up 35 points but it wasn’t enough. Pima’s Robert Wilson added 15 and 7 rebounds. Meanwhile Kennedy Koehler continued his strong season posting his 7th Double-double this season scoring 15 points and grabbing 13 rebounds, recording one in every game this season. Western Arizona leading scorer was Bryson Langdon who finished the game with 23 points. The Aztecs will look to get back to their winning ways as they hit the road to play the 1-6 Central Arizona College. It will mark Pima’s fourth straight conference game, this time at the Chap Center in Coolidge Az. Tip Off will be at 7:30 p.m. Dec 5. Nov.28 Pima finished their 6 game home stand with a win in a hard fought battle versus Eastern Arizona. The Aztecs Beat the Gila Monsters by eight, 97-89 to improve their record to 4-2 loses. The Aztecs jumped out to a big first half lead. Carrasco scored 18 of his 23 points in the first half, as Pima took a 15 point lead going into the halfway point. The Gila Monsters managed to claw their way back into the game taking advantage of a few aztec turnover even taking a brief lead 84-83 late in the second half with 3.20 left. It didn’t last long as Pima retook the lead in the next possession and never looking back after that. Koehler tacked on the next five points ending the game with a team high 24 points and 10 rebounds. The Aztecs also got a double-double from Robert Wilson, who added with 22 points and 13 boards being the third aztec to finish the game with 20 or more points shooting 7 for 10 from the field. Nov.20 The Aztecs came up short again dropping their second game in a row this time versus in-state rival the Apaches of Cochise Community College. The Aztecs jumped out to a quick 10-4 lead then the Apaches went onto a 26-0 run never looking back. Pima had an abysmal first half again heading into the break down by 18. Pima got a burst of energy and shot their way back into the game after going down 64-38. Coach Perbody went to the bench spanking a 12-0 run from the second unit. Pima ended up going on a 26-6 bringing the score to 70-64 after chopping the lead to 6 with a Kennedy Koehler 3 pointer. Koehler lead the team in scoring with 29 points and grabbing 12 rebounds racking up his sixth double double of the season. Pima got a productive performance from the bench as they scored 40 points. Pima’s leading scorer off the bench was Freshmen Jake Lieppert who had 19 points and 9 rebounds. Cochise’s leading scorer was Freshman Chris Whitaker who showed up to play, putting on a 40 point dominating performance going 7-9 from the three point range. 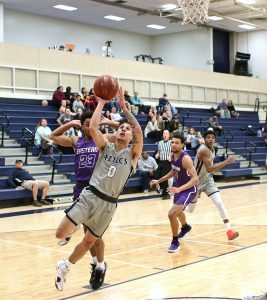 Nov.17 Pima Community College came up short in the finals of the Aztec Classic in a rough game versus Odessa College. The Aztecs were down 15 at halftime and couldn’t find a way back into the game. Pima shot 31.1 percent from 3 point range on 9-28 shooting and 41.9 percent for the game. As the Wranglers put on a defensive clinic as they racked up a total of 14 blocks and outrebounded Pima by 21. Odessa shot 53.8 percent from the field shooting 35-65 while making 5 of 8, 3 point shots. Kennedy Koehler finished with his fifth double-double to start the season with 18 points and 12 rebounds. Nov.16 Pima played a close game as they suited up to play Golden State Prep from California. The Aztec starters came out ready to play as they all scored in double digits. With Abram Carrasco leading the way with 19. Pima took a 9 point lead into halftime 43-34 and traded baskets in the second half winning by 8 points 95-87. Sophomore Kennedy Koehler continued his impressive start to the season as he recorded his 3 straight double-double with 15 points and 14 rebounds. Not to be outdone teammate Robert Wilson put up 15 points and nabbed an impressive 17 rebounds. Improving their record to 3-0. Nov.15 The Men’s basketball team improved to 2-0 to begin the season taking game one of the Aztec Classic on Nov. 15 With a thorough 51 point beat down of Grand Canyon University Club 117-66. Koehler recorded his second Double-Double to begin the season. Koehler lead the Aztecs in points and rebounds putting up 23 points and pulling down 12 rebounds. Freshmen Rashad Smith put up a double-double as well scoring 11 points and dishing out 11 assists. Robert Wilson fell one rebound shy a a double-double himself as he racked up 14 points to go along with 9 rebounds. 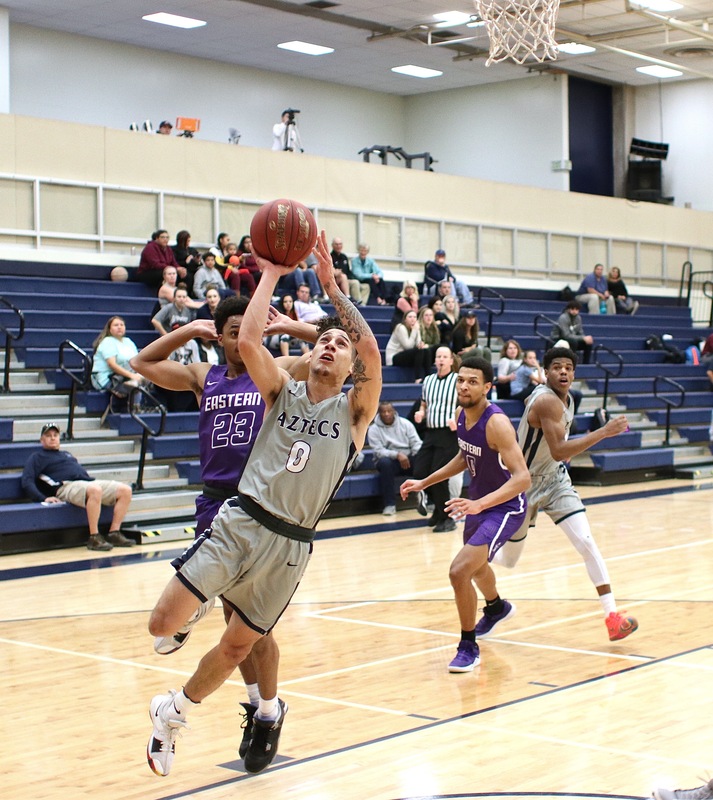 Pima’s second leading scorer came off the bench as Deondre Eason tacked on 20 points shooting .750% from the field on 8-12 shooting and 4-6 from 3 point range. 3 of pimas five started scored in double digits.